Steve Le Marquand and Alison Whyte. Image by Jeff Busby. What’s not to get excited about? C’mon! You may have studied it to death, but Ray Lawler’s iconic play, Summer of the Seventeenth Doll, in this revival by Neil Armfield for Belvoir, is of the highest calibre, like all my dad’s butterflies; captured and neatly killed in a jar of ethyl acetate, perfectly preserved and pinned down, and ending up in a Perspex box on the wall to be admired and wondered at (my dad’s an entomologist so we grew up getting just as excited about dead insects as living ones). Look, this will probably be the best you’ve seen the Doll done. You might not love it but I think you’ll find that, like a fine wine, this is a play that’s getting better with age (the further behind we leave something, the easier it is to look upon it with nostalgia? Of course, this doesn’t apply to Mt Isa and certain ex-boyfriends). Lawler’s classic could be considered the Grange Hermitage of Australian drama and if you miss this vintage, you’ll probably be left to wonder why you didn’t get in on the deal earlier. On the other hand, you might wonder what all the fuss is about. You should see it if only to work out whether or not to join the staunch likers or the wandering, wondering I-don’t-knowers, who are still smiling and nodding. Though the cane-cutting days are over, to a certain extent the story still stands, at least in terms of its look at the mundaneness of daily life and the relationships within a strained household. It’s the same these days but different. The characters loom large, like paper dolls; exquisite 1950’s colour cutouts. The wardrobe choices are fabulous. Truly, these are some of our most recognisable Aussie types. There’s the jaded Roo (Steve Le Marquand) and his comical best mate, Barney (Travis McMahon), the cane cutters from Queensland, who spend the long months of the layoff each year at old Emma’s house down south. This year, the seventeenth (I know you’ll count the kewpie dolls too), the group dynamics are a little different, with Olive’s stuck-up city friend, Pearl, coming to stay, Bubba (Eloise Winestock) from next door all grown up and Roo’s rival from up north, Johnnie Dowd (James Hoare), dropping in and upsetting the apple cane cart. The women in this cast are so strong that, collectively, they outshine the male talent, though fans of Le Marquand will disagree. I disliked his Neanderthal jaw, which seemed to set in stone his character, which was more a caricature than the real guy with real hang-ups and real self-loathing beneath. On the other hand, Alison Whyte as Olive (for the first half of the Brisbane run) is more believable, surviving with and without her Roo. She has her life with him and her independent life, which is just fine thank you very much, without him. Where Le Marquand’s emotion seems overplayed, Whyte’s is – mostly – spot on. There’s a bit of Blanchett in her subtlety and it suits her. If you’re going to borrow, borrow from the best. Helen Thomson as the prim and proper Pearl, with her Julia-doing-her-best-to-emulate-Ita pitched voice, almost steals the show. I adore her. I must practice chortling just like her. 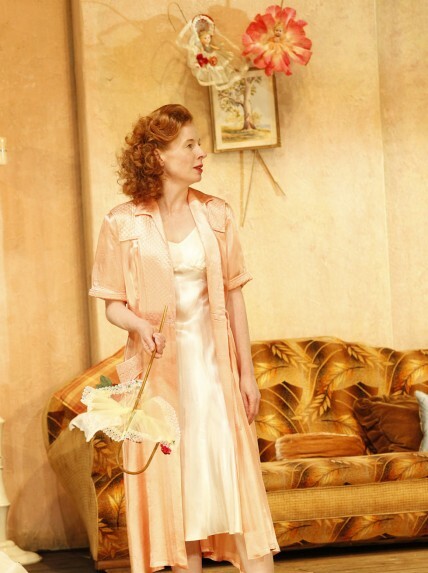 But then there is Robyn Nevin as Emma, a study in sublime confidence and the nuance of character. Of course we expect nothing less from Nevin. She is our Judi Dench, our Meryl Streep and the price of a ticket is worth seeing her performance alone. These tough women remind me of my mother’s family, sisters under different matriarchal roofs, the mother and the grandmother I hear so rarely about, the daughters learning how to survive together and apart. The stories are sobering reminders of how lucky we are now. Theirs was a different, more difficult, era. Obviously, being so young myself and not having had the chance to hear it authentically at the time, I find the language and the slang within it, the nasality, the phrasing and inflection on stage all real enough, though at times the acting is too much. We can only hope that the nauseating dialect, for which we are well known as a nation, thanks largely to this play, is a dying sound, reserved for use in the theatre. Rarely. Would somebody tell Gillard? And Hollywood? Thanks. There is terrific use by the actors, of space offstage, with voices coming from the wings, as if in another part of the house and, at least to the carnivorous amongst us, the appetising smell of sizzling bacon, creating a fourth dimension and lulling us into a false sense of security before the storm. Act 3 is suddenly and dramatically stripped bare; the shock of Armfield’s high walls (like Olive, I hate their colour) brought from his “little corner” at Belvoir, made more imposing than cosy. For a production so intent on its detail, it’s strange to have a kitchen window through which the breeze blows, but out of which we see only black, no matter the time of day. Strange too, to have a set of stairs in Emma’s house, leading to the bedrooms, that appears to be constructed from steel and concrete rather than timber. The working pianola gives us the sense that Emma will not always be around but her legacy will live on and the past will always linger. Are they deliberate attempts to place this play nowhere and at the same time, within an otherwise exact design, precisely “then” and eerily “now”? When I think on them, these ill-fitting elements, along with the over-fought fighting, the over-crawled crawling, the over-shaken shaking etc, work their way into my head like wood rot, spoiling the naturalistic style Armfield would otherwise have me embrace. This is old-fashioned storytelling but not like the telling of a fairytale, in which we can, through long-practiced habit, lose ourselves in the fantasy. We don’t so much get involved in the lives of these characters as watch and wonder at what’s happening, the way I marvel at the people who inhabit my mother and my aunt’s stories without being able to relate to them. We abhor the treatment of women-at-home and the demands of men-at-work (no matter that the women, in their perfectly applied red lipstick, are away every day pouring beer at the pub for the lazy bastards who are off work for five months and sitting around somebody else’s house without lifting a finger, drinking somebody else’s beer or painting somebody else’s town red). We wonder at the traditions and tawdry expectations of a time gone by. No doubt there is a generation of theatre goers who know these scenes all too well. We wonder if so much has changed. Or perhaps we don’t. Perhaps we admire the high production values and relish seeing some of our top actors on a stage in lil’ ol’ Brisbane. I wonder. I can’t help but think what did we need this very expensive, highly regarded piece of theatre to do? And, with regard to the story, the essence of which we think is long-gone; I can’t help but think, with so many friends electing to take on work with mining companies, I’m seeing the same thing happen here now. The men fly in, fly out, leaving the women at work in the home to bring up the children and run a small business to boot! Too bad if she has a notion to continue studying or take up Flamenco dancing! She’s tired and faded and preparing dinner and perfectly applying bright red lippy for when the husband comes home so he sees how much his hard work is appreciated by the Doll he married. It’s a reflection of the saddest aspects of a working class life. Do we have that still? Not like our parents and their parents did. Now we get our red lippy from the Chanel counter! Now we go for drinks and tapas by the water! Now we’re not putting up with the same bloody curtains for sixteen years! Now it’s retro-trend to arrange the flowers in a re-cycled beer bottle! Frankie says so! Everything is temporary, perhaps more so now than ever before. We just can’t bear to live out the long, languid days, accepting second best anymore. We refuse to live that sort of lacklustre life, even if our new, more exciting (across social media at least) lifestyle will be our undoing. Summer of the Seventeenth Doll is a play I’ve never had a lot of love for. It was a reflection of real life for such a short time. We have a short history and, as a country, we’re moving forward faster than the pessimists (and some playwrights) would have us believe. We’re also keeping a lot of Perspex boxes out. Theatre needs to keep up. Playwrights need to catch up. It’s incredible that we have a revival of a play blessed by its 92-year-old playwright. Now let’s move on. When I go to the theatre, I would rather be swept away by what’s happening in a world that resembles my own, than be asked to look on and observe what’s already happened in somebody else’s droll one. Like an old photo album or the butterflies on Dad’s wall, Armfield’s is a beautiful production, but it’s just not as exciting as I’d thought it would be. Perhaps you thought differently.